Hi again… Resuming our previous post, Koolfit has been conceived to bring a private cloud service to the market. Koolift is based on the OpenStack and other OpenSource related projects. Koolfit takes to your doorway the power of the openstack community and distributed computing. Before moving on to the next lines, I want to thanks to @chalescobedo, @crancurello, @galvarado89, @evictoria3 and @fsalas0712 for their tremendous support to build this comparison. Koolfit supports many configurations (check this out at koolfit.mx for further info)… the smallest Bare Metal bundle is called Cumulus and you can have 480GB of memory to split over your tenants. You could assign tenants to specific users or maybe you can rent tenants to external users. You will be able to define quotas inside any project and delegate the administration of it. Dashboard brings access to features that come from last released projects like heat (templates to orchestrate apps), neutron (network orchestration), cinder (storage volumes orchestration)… we are in OpenStack Juno… and Kilo is our target through out the next months. Everything is high available, data is protected through a double copy using Ceph redundancy features (we are in version Giant). All storage systems have been built on SSD. Flash Cards have been used as journal. Every component is monitored using serverdensity.com (check my latests post for details). We had to develop some pieces of code to make it works thru APIs. Today, you can have your own dashboard to configure alerts on your applications and their related infra components. Below you will see a screen shot of the online quoting tool. 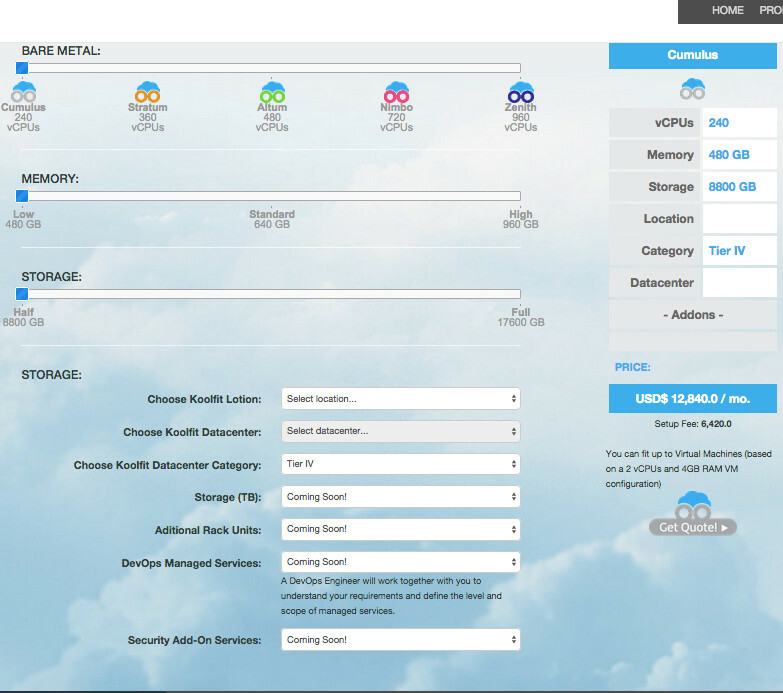 Koolfit Cumulus Bare Metals costs $12.8K/month with 480GB physically dedicated memory, 240 vCPUs and 8800GB of SSD physically dedicated storage. Now, let’s go to AWS calculator. of course configured 100% utilization. Get your own conclusions by now… mines are coming.. See you into the next part!